Today the Upper Derwent Valley, stretching for miles through steeply wooded hills, is a peaceful place of outstanding beauty. 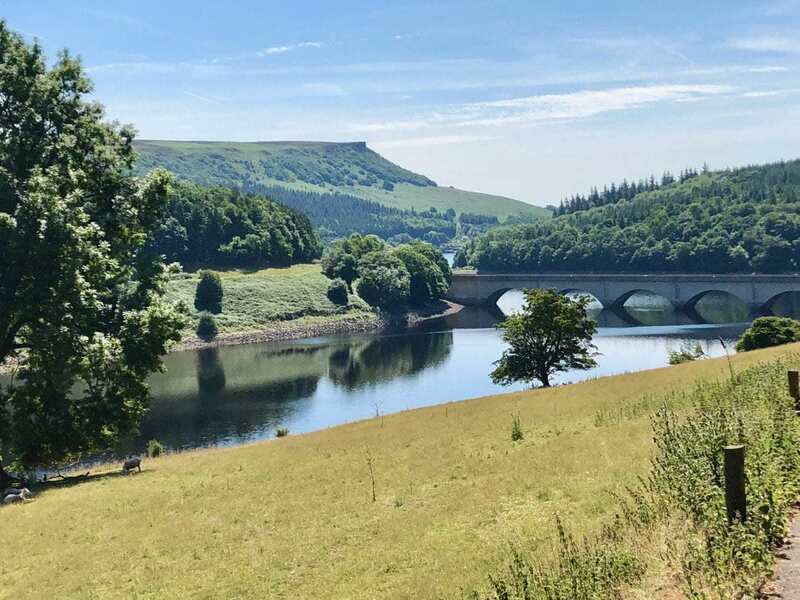 The glassy waters of Howden, Derwent and Ladybower Reservoirs reflect the ever-changing colours of the trees that line their banks, and the high slopes of wild moorland on both sides are home to abundant animal and bird life. The Valley today is a place for carefree weekend recreation too. Every year more than two million people visit the area, with hundreds of thousands of walkers, runners, cyclists and horse riders enjoying the country trails, while families picnic at the edges of the water. The picture has not always been so idyllic, however. At the beginning of the 20th Century two small but thriving villages were situated in this part of the Upper Derwent Valley: Derwent and Ashopton. They were important communities, in which hundreds of people worked and played and went about their daily lives. 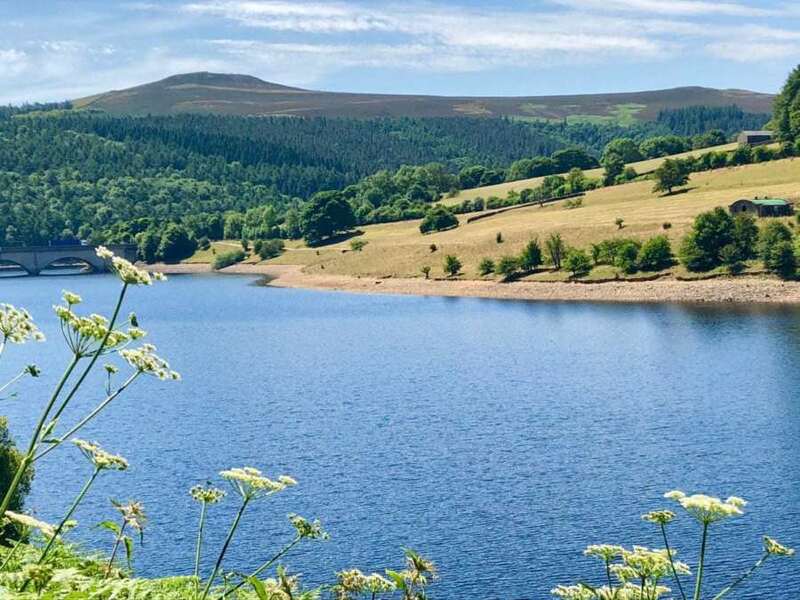 In the 1930s the Derwent Valley Water Board needed to supply more water to Sheffield, Derby, Nottingham and Leicester than could be provided by the existing Howden and Derwent Reservoirs, and preparations began for the creation of a third enormous reservoir, Ladybower. Ladybower was to be positioned adjoining the southern end of Derwent Reservoir, which took its foundations deep into the heart of the two villages. And so in the ten years between 1935 and 1945, the buildings of Derwent and Ashopton were compulsorily purchased, despite much local opposition. The owners of the buildings were moved on, the bodies of their relatives exhumed from the village churchyard, and their homes were reduced to rubble. Both villages were drowned as the reservoir was slowly filled, and the remains of the two communities disappeared underneath the deep waters. The village of Derwent was located some distance into the valley. It had twisting streets of stone cottages, alongside which the River Derwent flowed under bridges. Children played in the school yard and villagers were christened, married and buried at the village church. Derwent even boasted a grand country house, Derwent Hall. Built in 1672, Derwent Hall was an impressive stately home designed in the Jacobean style. At one point owned by the Duke of Norfolk, it stood in magnificent gardens, with ornamental trees and a large fishpond. 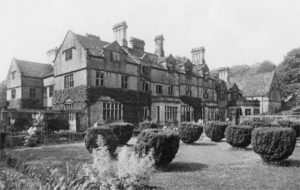 After centuries as a private house Derwent Hall became a youth hostel in 1931, opened by the then Prince of Wales, and operated successfully until it was compulsorily purchased in 1939 and demolished to make way for the reservoir. The Church of St John and St James, built in 1757, was also a beautiful and notable part of the village. 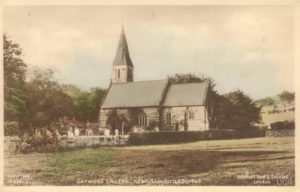 It seated 140 parishioners and regular services were held there until the final one on 17 March 1943. The bodies of 285 people were exhumed from the church graveyard and reburied in the nearby village of Bamford, and most of the building was demolished. The church spire was initially left intact as a memorial to Derwent, and for more than a year it rose eerily out of the dark waters of the reservoir, marking the site of the lost village below, until it too was demolished in 1947. Only the bell from the church was saved, and it still rings out from St Philip’s Church in Chaddesden, near Derby. Not all parts of the village were lost to the water, however, and indeed a few houses above the water line survive to this day, including a number of farms. There is still a civil parish of Derwent, although at the 2011 census the village population stood at less than 100. 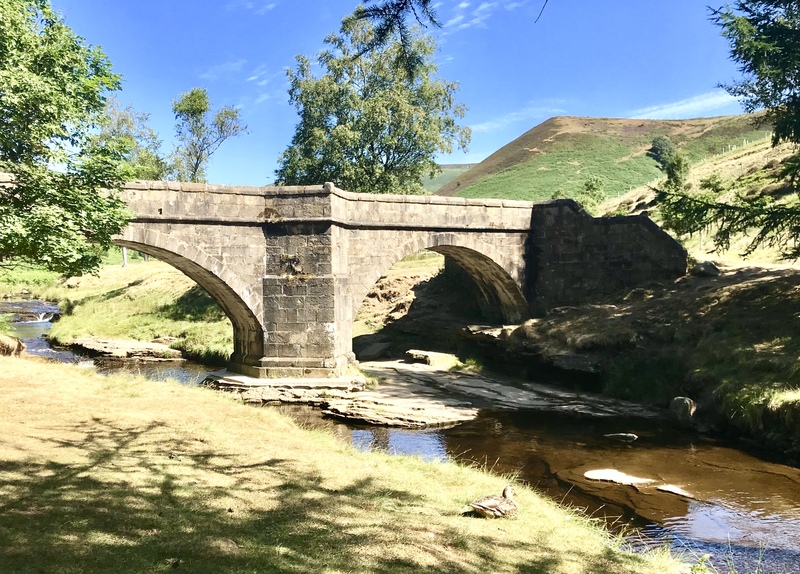 The beautiful 17th Century packhorse bridge that once spanned the River Derwent close to Derwent Hall also still stands. A Scheduled Ancient Monument, it was removed stone by stone when the grand Hall was demolished. The bridge was rebuilt at the head of Howden Reservoir in 1959, in an area known as Slippery Stones. Derwent’s old War Memorial was also saved from demolition and is now sited along the Upper Derwent Valley road to the west of Ladybower Reservoir. 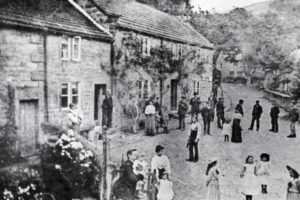 The village of Ashopton was busier than Derwent, being located on the main road between Sheffield and Glossop, and standing at a crossroads where a journey could be broken. 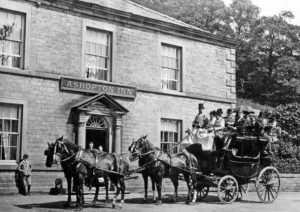 The popular Ashopton Inn was a bustling pub, just as popular with visiting walkers and cyclists as it was with local villagers. The village also had a Post Office and General Store, a chapel, a garage and numerous picturesque stone houses and farms. 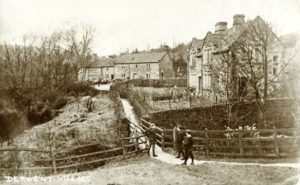 Its industry was largely based on farming, and an annual wool fair was held in the village every July. The Wesleyan Methodist Chapel, built in 1840, was a plain, classic building, not as architecturally grand as the Anglican church in Derwent, but every bit as much a key part of village life. The final service was held there on 25 September 1939, with the last hymn reportedly being ‘The Day’s Dying in the West’. The chapel was demolished in 1943. Sadly, the ruins of the buildings of Ashopton will never again be seen, as layers of silt have covered them over completely. During particularly dry summers the years are stripped away for Derwent, however, and the ruins of the village appear above the water. The dry period in 2018 has once more revealed many features of Derwent, including the footings of Derwent Hall, the foundations of a number of cottages and outbuildings, two arched bridges, and the rubble of the church. It is fascinating to explore the lines of old roadways, to see neglected remnants of architectural beauty, and to imagine the lives of the people who lived and worked in the village every day. 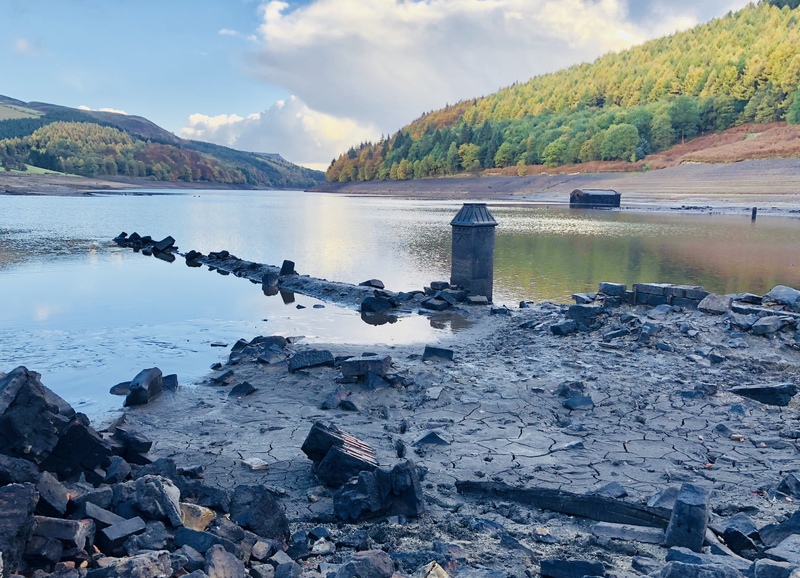 It is a privilege to walk among the ruins of their buildings now, to tread in their footsteps, knowing that by next Spring these lost treasures of Ladybower will have slipped beneath the water again and be absolutely hidden from all who visit the Upper Derwent Valley.